bad model textures poor model texture alignment found a model in need of tlc? 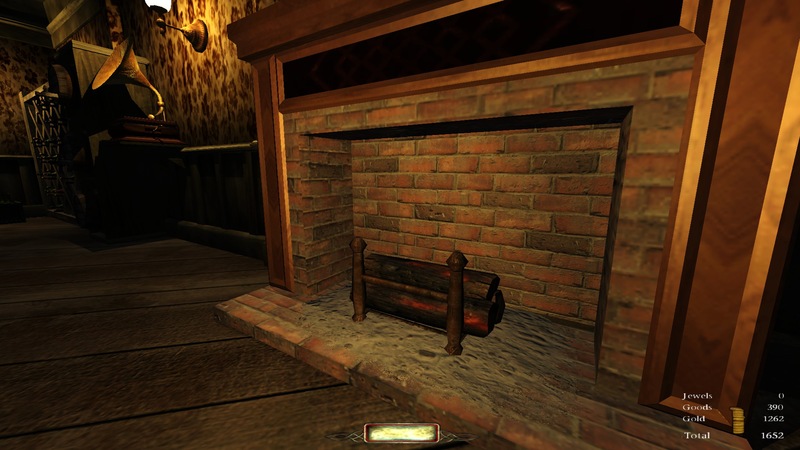 mis-aligned textures - on the model above you can see on the front of the mantle face where the brick textures isn't aligned. mis-scaled textures - the brick textures are blurred up close - which us highlighed by a patch I placed at the back of the firebox to cover part of the wall-model poking through. The poor texture on the upper mantle face - that even in direct light is very dark and show little detail. change the dimensions - as this may break existing maps that have used that model. radically change textures - for the same reason as above, but if unsure ask the team. remove hidden/internal shadow mesh - as this directly effect model performance with lit, but if the shadow mesh is poor, ask the team. The grandfather clock has a pure white specular, whether through the material file definition or through the texture itself, I haven't checked. Same for the painting models, iirc, specifically the frames. Any model should be tested against cubemap lights to check if their specular makes them glow like hell, imo. Not the default texture...which one in particular was causing the problem? I had to search all the way to 6/2017 in the Discord to find the screenshot of the bug in there, I tried to reproduce it with the paintings in there, and many more, to no avail. The new version of cubic lights doesn't have specular interaction anymore, but just to make sure i looked at painting_01_s.dds and the texture is fine. It's no longer an issue, then. Do try to put a cubic light like lights/ambientcube/cubedefault and models/darkmod/furniture/grandfather_clock.lwo near each other though, it completely deforms the wood texture in my tests. Edited by Spooks, 26 September 2018 - 02:04 PM. I increased lowered the bottom of the horizontal wood part so that it lined up with the bricks. I also replaced the original brick material. This had been baked into a new texture, so the only way to properly fix the UV mapping was to apply the material on which it was based. Edited by R Soul, 26 September 2018 - 05:10 PM. This cant be used to replace the current model, due to what mappers might have done in the vicinity. It should appear as a new model. Fantastic, imho the specular on the wood is too high. And if I maybe so bold the grill/pattern just under the mantelpiece needs cleaning up. This cant be used to replace the current model, due to what mappers might have done in the vicinity. It should appear as a new model. Edited by Bikerdude, 26 September 2018 - 03:26 PM. Stone extensions matching the existing brickwork no longer line up. A lower mantle makes non-moveables now hover. In general, changes in form factor or texture alignment could undo what the mapper has done around a model. I second that. Don't just replace stuff. Models aren't that heavy-weighted in terms of file size. It may, however, be worthwhile to think of a way to mark such models (and textures/materials) as deprecated to make mappers aware of the fact that they don't meet the current quality standards anymore, as they may not be noticing the issues at all. I've long wished for such a feature, but I'm not sure how it would work. Hasen't team being doing this for a while already..? as there is a bunch of models marked as such.. I moved them down a little bit to make them line up with the brickwork. However, I do agree that some changes entail making the resource a new thing rather than a replacement. In this case though, the new model is an .lwo not an .ase, so it won't overwrite the original, albeit on a technicality. I know how we can tell users an object is deprecated, or provide any other info: have a separate text file (or set of text files) with some simple formatting (like the code blocks in skin or material files) which includes the model path and a comment. When a model is selected, DR can read the file and display any info it finds. DR can have its own one buried in the .pk4 files, and users could include their own to explain their own models if necessary. Edited by R Soul, 26 September 2018 - 04:30 PM. No, there's not, because there is currently no way to do this for models. Ah, Im confusing entities with models then, some of which have thier own models..? Edited by Bikerdude, 27 September 2018 - 02:25 AM. We could move deprecated assets into their own dedicated PK4. Call it something like "tdm_deprecated_v2_07.pk4". Then on occasion when an update is pushed out we delete the local copy and archive it alongside fan missions and game update packages. Additionally Dark Radiant could warn mission authors when content they've referenced is flagged for deletion or replacement. Encourage people to extract and bundle content like this with their mission if they want to use it. Of course that doesn't solve the problem with existing missions. In that case I suppose you install the earliest archived package alongside mission packages produced before the present date. It's a DR issue more than a TDM one. The issue is that models cannot be renamed or moved without breaking maps that rely on them. However, it would be nice to remove some low-quality models from DR so that mappers aren't tempted to use them without being aware of the problems. Somehow the problem models would need to be flagged in some way that DR can be made to understand, but that that can still be accessed if needed (in case someone wants to edit a map that uses the older models). Shall I raise a tracker request for this then? I've posted and linked this thread in the "Wishlist for DR" thread. But filing a bugtracker entry probably don't hurts. From what I understand, it would be very difficult to find a solution to this particular problem. How about coming at this from a different direction? How many low-quality models are there? Are we talking about just one model or are we talking about many models? If it's just this one model, do we know how many maps use this model? If the overall number is low, I suggest tracking down the author(s) of the map(s) and ask them to switch to the new model (like what was done when we switched over to the standalone version). Even if the number of low-quality models is high, it still might be more advantageous to track down the maps/authors than to somehow figure out a way to flag these low-quality models. Otherwise, continue to make new models and leave the low-quality models for people to squander their time. Its less about low quality than it is about texturing that needs to be corrected. the map might be too old for them to remember what models and where exactly they have used them. This would probably cause this process to become quiet tiresome for them, and many might not have the motivation to do this. The authors may have altered the models to their needs, for example by resizing or reskinning them. Unwanted side effects may occour. I am all for keeping the old models. They are not that big in size that they neccessarely have to be removed. Imho it is just about telling mappers to avoid using them and/or informing them that there are better versions available. A system as proposed above could allow this and is as far as I can imagine not too hard to implement. But Greebo (or anyone else working on the DR code) will have to tell us what he thinks about this before it really makes sense to agree on a final solution. What if the primary asset base was modified (from both game exe and DR) to lookup the asset on an additional/identical folder structure with a topend folder containing something like "updated/models/darkmod/>overwrites here<". The idea is that the original file acts as a fallback and DR would display the newest asset of the same name should one exist under the updated branch. Then maybe add a filter toggle (or dropdown similar to alternate skins?) to the model viewer that would say something like, "show depreciated" to toggle back to the previous iteration of that model. Since a lot of the models haven't been updated, it would just show them by default. This folder bin idea would just allow us to stash models of the same name, in otherwise identical places while preserving the original path for old FMs. The primary goal of the system is to get a painless method for pushing our best version to the modern TDM mapper. Cleaning up an old repository is hard, but things like this could be a safe alternative to all the file bloat. Waddayall think? EDIT: after reading the whole thread I think we're all reaching the same conclusion. I guess I just was more exhaustive on my explanation of how it could work. I am not sure, if this solution was already suggested, and I just missed it: Does DR always import all contents of all pk4-files? If not, we could move the outdated models into their own pk4 that is still available for TDM to read, but is excluded from DR. That way mappers don't see the old models at all, while TDM would still be able to access it for older missions. It would be great to have a sort of transition system, as it's not only about models, it's also about their textures and materials. I have no idea how should it look like though. At some point models will have to get replaced.